“Over the past three years the event has proven to be so popular that we are continuing our annual tradition where faculty, staff, students and members of our community can gather together and bring Shakespeare’s beautiful ruminations on love to life,” according to Scott Jackson, executive director of Shakespeare of Notre Dame. 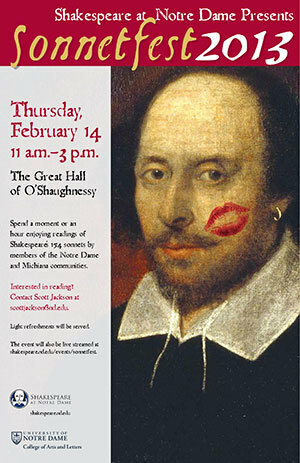 All 154 of William Shakespeare’s sonnets will be read sequentially in the Great Hall of O’Shaughnessy Hall on the Notre Dame campus from 11 a.m. to 3 p.m. Feb. 14 (Thursday). The event, sponsored by Shakespeare at Notre Dame and the College of Arts and Letters, is free and open to the public. Shakespeare at Notre Dame consists of the McMeel Family Chair in Shakespeare Studies, the Ryan Producing Artistic Director, the Notre Dame Shakespeare Festival, Actors From The London Stage, ancillary lectures and events, and library collections. Actors From The London Stage is a national outreach program of Shakespeare at Notre Dame. Shakespeare at Notre Dame’s mission is to become the pre-eminent venue for the study and performance of the works of William Shakespeare, providing Notre Dame and the wider community an on-campus culture steeped in the works of Shakespeare — both on the page and on the stage. Originally published by Chuck Gessert at newsinfo.nd.edu on January 29, 2013.